This bear cub was very curious about why I was taking its picture. Get over it, bear! This is the Best of Skagway series. Most people coming to Alaska for their vacation want to see some wildlife. Alaska is the last frontier so it should be chock full of wild animals. Well, let me tell you that it is. I see wild animals all of the time, and I am going to tell you about places where you may spot wildlife while your visiting. 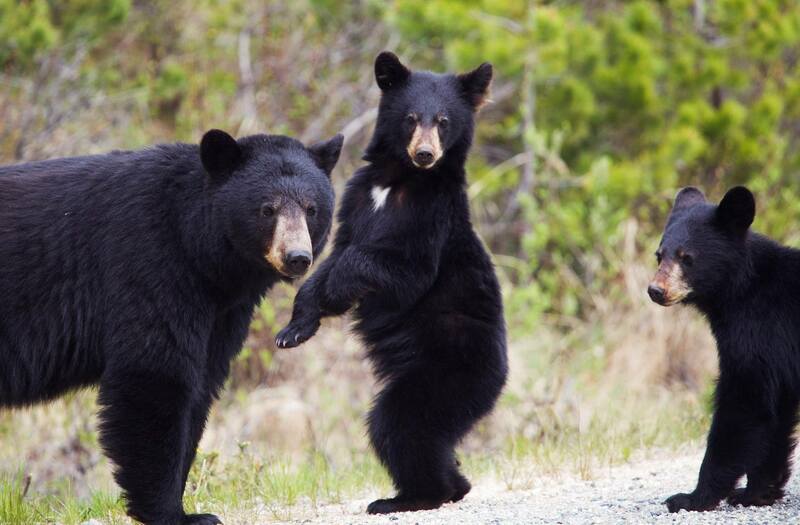 Today’s Best of Skagway blog is all about wildlife viewing. What a super idea! Every good thing in life requires preparation. If you’re going fishing and forget to bring a fishing rod or beer, you’re going to have a bad time. To get the most out of your wildlife viewing experience, bring binoculars or a spotting scope. Seeing a whale is great, but seeing its eyeball up close is far better. Birds are fun to watch, but you’re not going to see much if they’re way up in a tree and your squinting to make them out. You can bring a camera too but don’t get so busy taking pictures you forget to enjoy the moment. Locals simply call it The Point and it’s a great place to spot wildlife. Right on the ocean, you may spot just about any variety of ocean wildlife found in Southeast Alaska at this location. I’ve seen humpback whales, orcas, harbor seals, sea lions, otters, Pacific white-sided dolphins, Dall’s porpoise and all sorts of water birds at The Point. I have also seen a lot of fish because I catch them and pull them out of the water. If you look above the White Pass train shops to the east, you will see a steep cliff face. I often see mountain goats in this spot. You pass this area on your way to the Gold Rush Cemetery and it costs you nothing to look up, so make the most of the opportunity unless you have a neck injury. At Lower Lake, I often see birds including ring-necked ducks, mergansers, woodpeckers, eagles, hawks, and songbirds. At Upper Lake, you may see a hoary marmot because there are plenty of them up there. Listen for their call, which sounds like a crying baby. Don’t mistake it for a crying baby and go traipsing all over the alpine looking for it. All you will find is that crazy screaming marmot. I also see grouse up there when I’m hiking. One time I saw a family of grouse and it reminded me of the intro of that old TV show The Partridge Family. Located about 25 minutes from Skagway by vehicle, Dyea is a great place to spot animals. You could see a bear and an otter on the same day if you’re as lucky as I am. I have also seen blue herons, sandhill cranes, northern harriers, seals, porcupines, marten, and least weasels in Dyea. Sometimes seagulls are everywhere, but who cares? We hope you enjoyed today’s Best of Skagway romp. Tune in next Sunday when we explore more Best of Skagway wildlife spotting opportunities in the Yukon. Until then, oodbye-gay. How is the camping in Skagway? Aren’t Skagway birthday’s great?